For many ecommerce marketers, product pages are an end game, a “we’ve nearly got ‘em” kind of affair. 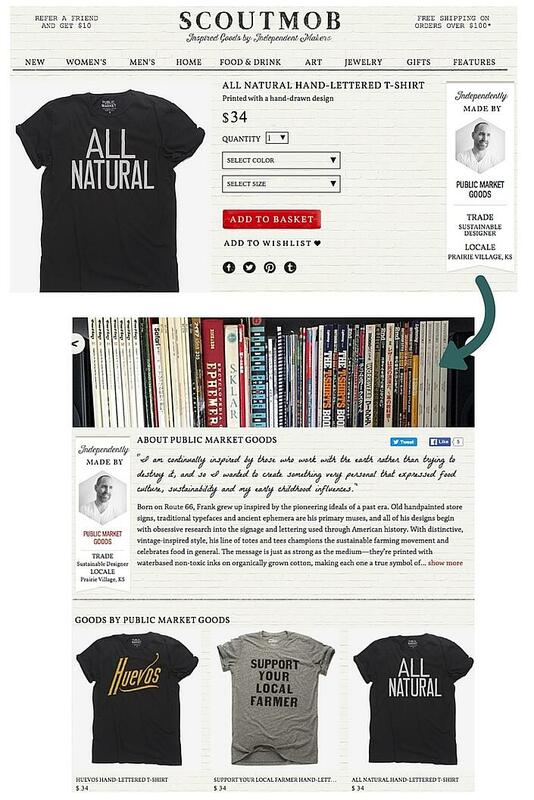 We're all aware of the staples of good product page design - unique descriptions, sharp images, big calls to action, social sharing buttons, the list goes on. But how are brands raising the bar, taking a step beyond product page best practice? We’ve taken a look at some great examples of winning ecommerce product pages that go the extra mile: utilising the power of thoughtful design and content to create a digital experience worthy of any fancy offline store. From rich media to great product stories, take some notes! Why we love it: Lush has (by far) some of the most creative and engaging product pages on the internet. Combining rich video with descriptive content, a strong CTA and social proof - c'est beau! Why we love it: We can't hide it. We've got a massive (fangirl) crush on Reformation. With irresistible design, full-screen imagery, minimalist structure, in-depth product details and a sustainable slant...what’s not to love? Why we love it: Scoutmob uses its product pages to focus on one of its core USPs - offering unique goods from independent makers. Highlighting the origins behind each product shares a unique insight into the humble beginnings of every item, helping build the brand's story and gain trust (also, the cheeky cross-sell off-page doesn't hurt). Why we love it: Shop Jeen’s humorously garish USP is well conveyed in their copy and page design. Why we love it: Clear, crisp and minimalist. Alongside its visually appealing modular design, the homeware brand squeezes in a handy assembly video, a nice product description and the designers story - helping to bring the product alive and punch personality into the page. Hem also integrates its Instagram account, a great way to diversify its communication channels and marry the brand’s image to the glossy, editorial-style of the social network. Forrester reports 20% of customers engage after the point of purchase to express their affinity for the brand or product: integration is vital to take the brand off the page and into people’s social spheres. Friends trust friends. Trust builds sales. 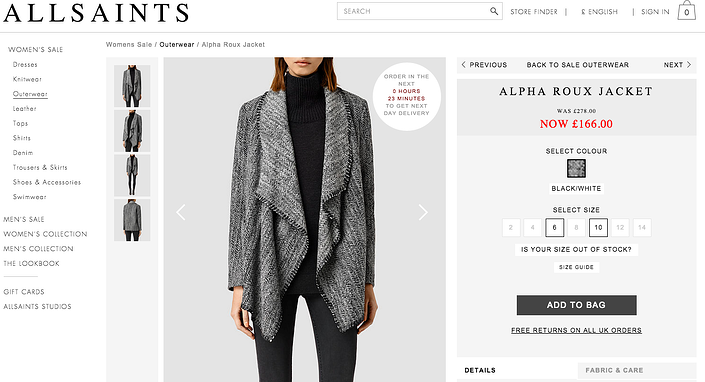 Why we love it: AllSaints gets people shopping by integrating a time-based incentive to purchase. Tempting! 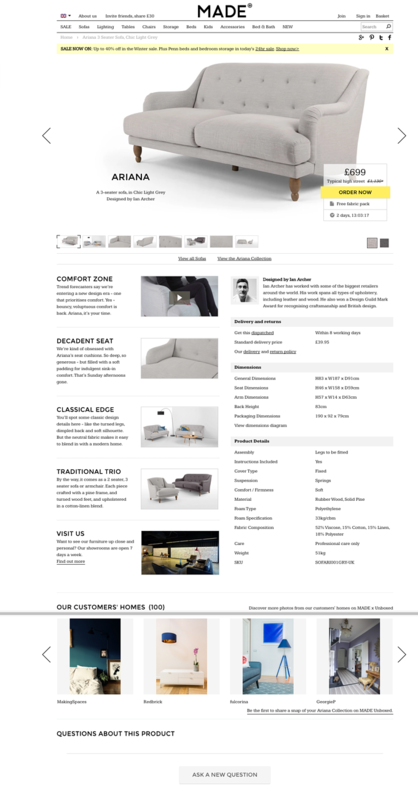 Why we love it: MADE.com’s product page is a decadent devotion to description, with everything a buyer would need to know - from dimensions to fabric composition. We also love the "our customers’ homes" section, taking the product into the real world, offering inspiration (and encouraging cross-sells). Why we love it: Social proof sells. According to research, 63% of consumers indicate they are more likely to purchase from a site if it has product ratings and reviews. 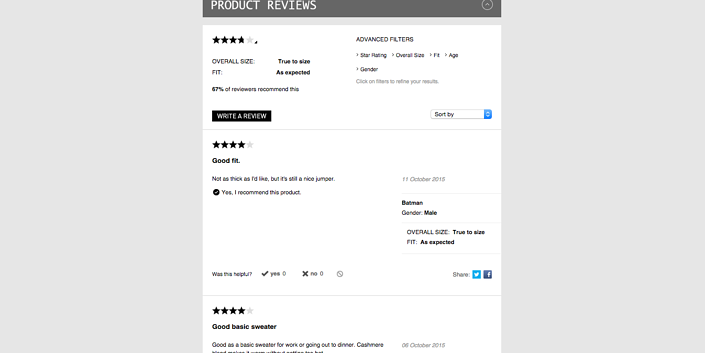 UNIQLO has integrated product reviews on to most of its product pages - with genuinely insightful comments, as opposed to simple stars. Whether calculating an average review score and pushing it to the top of the page or carving out a section on your product page for comments: people trust people, so make it a priority. 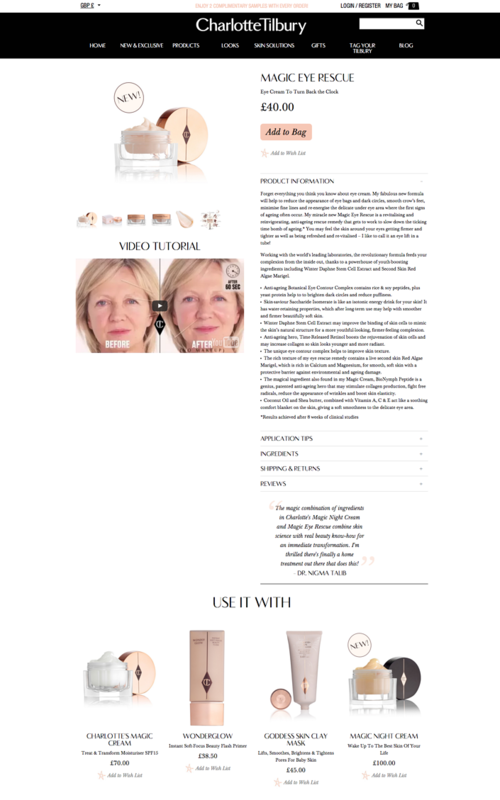 Why we love it: Charlotte Tilbury brings an educational element to its product page, offering video tutorials, detailed product information, application tips and reviews - all in one page.